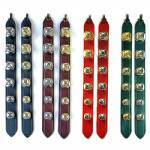 This 6-bell door strap is ornamented with a leather tie and three sizes of silver- or gold-tone steel jingle bells. The bells, ranging from 1" to 1 1/2" in diameter, are arranged so the largest bell is at the top of the strap and the smallest is at the bottom. This strap is a good choice if you would like to train your dog to ring the bells to ask to go outside. It is long enough for almost all dogs to reach with their noses. 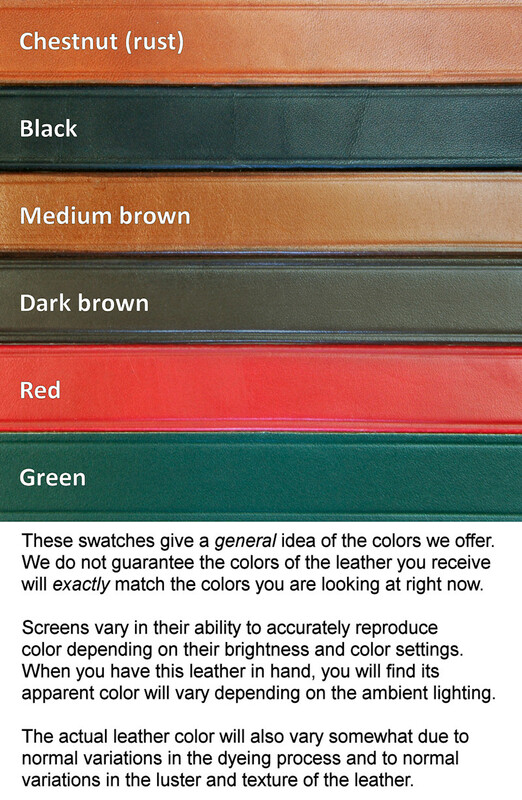 The strap is 1 1/2" wide and 17" tall, not including the leather tie, and is cut from firm, high quality leather. (Similar straps sold by others are typically only 1" wide.) The edges of each strap are hand dyed and decoratively creased.